Production: Thick oaken bassy Florida style. 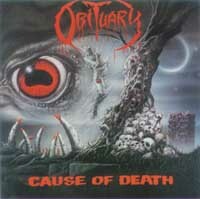 Review: Obituary make metal from the contrast between a consistent rhythm and a shifting tonally ambiguous riff, using tempo as an instrument of blunt destruction in spanning calibrations from doomy lumbering passages of shuddering chords at the speed of deathbed breathing to the midpaced fast tempo range used by bands such as Sepultura or Slayer, not dependent on speed to free the drums to serve structure rather than consistency. Creative and delicate playing from the strings, drums and voice do the finishing work on an epic in the making from its adventurous sense of space to song. As rhythms melt into the mind of the listener, a range of chords and a pace of undulation between the notes determine the distance between inception and resolution to a melody, with a greater range determining the space between which the song moves, and its internal stops within that matrix. An unfolding sequence of layered structure emerges from this work in recollection and analysis, spelling out in the darkest hand of force since Black Sabbath a tumbling apart world of chaotic and absurdist existence made sensible only through a rigorous and deconstructive logic. This intensifies as the songs emerge and even after their virii have concluded and identified a dominant thematic structure; the modulation of tone which could be mistaken for key change is an index of variability which determines melodic potential in even chromatic and dark, double-picking doom riffing which slams to a close in staccato blasts of power chord. Melodies conclude in violent ways, deconstructing at the root note and folding over to another scalar dimension of the space between notes. This heavy harmonic influence makes the music both broodingly obscure and morbidly nihilistic and chromatic, providing a flavor which sets the pace for the ambient metal explorations which constitute the bulk of the album. Feathering movements of chords dive into large conclusions and race through changes to explode into their antithesis, a vengeful recursion of an opening theme in its backward logic affirming all of the negative spaces previously cordoned off by the directionality of melody. In the abstract, this album resembles a series of cave mazes leading to further and simpler depth as the descent intensifies; similarly, these chords collect and discharge in patterns of increasing division and reductivism of tone to direction. Totally nihilistic as it is, this work also provides a calming gentleness of wavelike sound which coordinated in strumming to the Doppler effect of its changing melody, seems a smooth and muscular benevolence even in the face of intensely horrific appearance.